Henry Blaine LYDA [Parents] was born on 2 Dec 1892 in , Henderson, North Carolina. He died on 27 Oct 1982 in Pickens, Pickens, South Carolina. Henry married Dora Bell MC MINN on 25 May 1913 in , Henderson, North Carolina. Dora Bell MC MINN [Parents] was born on 6 Jun 1894 in (Hoopers Creek Twp Hendersonville, Henderson, North Carolina. She died on 16 Aug 1945 in Morganton, Burke, North Carolina. Dora married Henry Blaine LYDA on 25 May 1913 in , Henderson, North Carolina. M i Frank Lee LYDA was born on 6 Feb 1915. M ii Pvt. Minus Blaine LYDA was born on 10 Jun 1917. He died on 13 Nov 1996. F iii Georgia Myrtle LYDA was born on 1 Jul 1918. 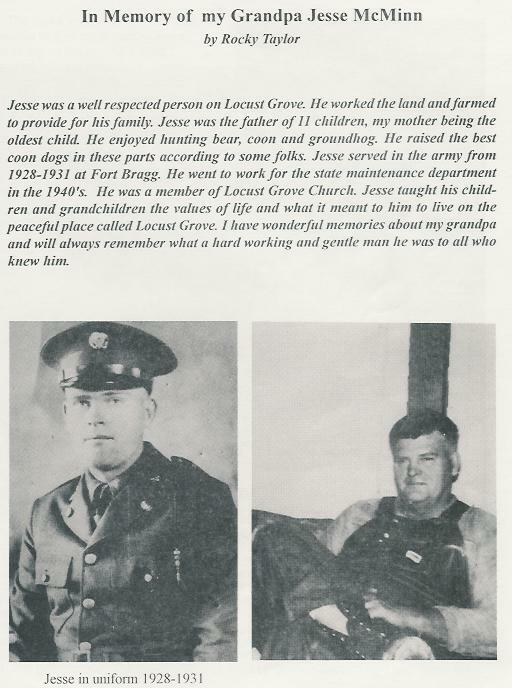 Jesse Albert MC MINN [Parents] was born on 16 Mar 1903 in Hogney Church Bldg, Hendersonville, Henderson, North Carolina. He died on 14 Jun 1966 in Hendersonville, Henderson, North Carolina. He was buried on 17 Jun 1966 in Locust Grove Baptist Church Cemetery, Henderson, North Carolina. Jesse married Polly Kate MC MAHAN on 7 Mar 1930 in , Henderson, North Carolina. Polly Kate MC MAHAN [Parents] was born on 7 Dec 1910 in Asheville, Buncombe, North Carolina. She died on 28 Sep 1999 in Hendersonville, Henderson, North Carolina. Polly married Jesse Albert MC MINN on 7 Mar 1930 in , Henderson, North Carolina. F i Noma Lee MC MINN was born on 20 Feb 1931. F ii Edith Idella MC MINN was born on 1 Dec 1932. She died on 27 Mar 2001. F iii Dorothy MC MINN.
F iv Elena MC MINN.
M v Kenneth Golden MC MINN was born on 9 Jun 1937. He died on 28 Feb 1997. F vi Lois MC MINN.
Richard Glenn "Ricky" MC MINN.
Golden Washington MC MAHAN [Parents] was born on 29 May 1875 in , , North Carolina. He died on 21 Apr 1960 in Hendersonville, Henderson, North Carolina. He was buried in Ebenezer Cemetery, Hendersonville, Henderson, North Carolina. Golden married Idella Telitha Alice COGDILL on 6 Oct 1909. Idella Telitha Alice COGDILL [Parents] was born on 2 Jul 1890 in , Madison, North Carolina. She died on 3 Jul 1967 in Hendersonville, Henderson, North Carolina. She was buried in Ebenezer Cemetery, Hendersonville, Henderson, North Carolina. Idella married Golden Washington MC MAHAN on 6 Oct 1909. F i Polly Kate MC MAHAN was born on 7 Dec 1910. She died on 28 Sep 1999. Leister MC MAHAN was born in 1912. He died in 1912 in Died In Infancy. M iii Ray Creo MC MAHAN was born on 6 Feb 1915. He died on 12 Jan 1968. M iv Gollie Carlton MC MAHAN was born on 10 Apr 1916. He died on 14 Jul 1952. 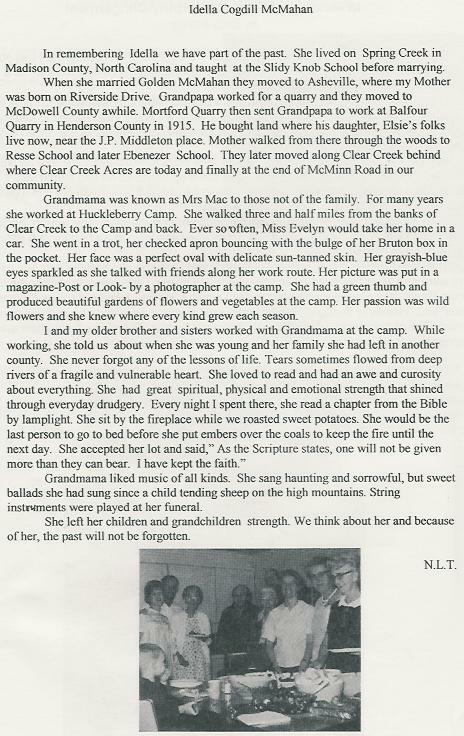 Lucy MC MAHAN was born on 13 May 1919. She died on 8 Aug 1919. M vi Glenn Henry MC MAHAN was born on 14 Jul 1921. He died on 28 Sep 1986. F vii Edna Idella MC MAHAN was born on 11 Mar 1924. She died on 9 Sep 1998. F viii Runa Colleen MC MAHAN was born on 22 Jul 1927. F ix Nellie Corrine MC MAHAN was born on 2 Dec 1929. Noma MC MAHAN was born about 1934. Grady John MC MINN [Parents] was born on 20 Feb 1911 in , Henderson, North Carolina. He died on 20 Jun 1981 in Bristol, Sullivan, Tennessee. He was buried in Bristol, Sullivan, Tennessee. Grady married Lillian Alice WILSON on 10 Mar 1932. Lillian Alice WILSON was born on 13 Jan 1913 in , Bedford, North Carolina. She died on 19 Jun 1981 in Bristol, Sullivan, Tennessee. Lillian married Grady John MC MINN on 10 Mar 1932. Golden Washington MC MAHAN [Parents] was born on 29 May 1875 in , , North Carolina. He died on 21 Apr 1960 in Hendersonville, Henderson, North Carolina. He was buried in Ebenezer Cemetery, Hendersonville, Henderson, North Carolina. Golden married Emiline before 6 Oct 1909. Emiline was born about 1880. Emiline married Golden Washington MC MAHAN before 6 Oct 1909. Sewell Archibald Albert MC MAHAN was born in 1832. 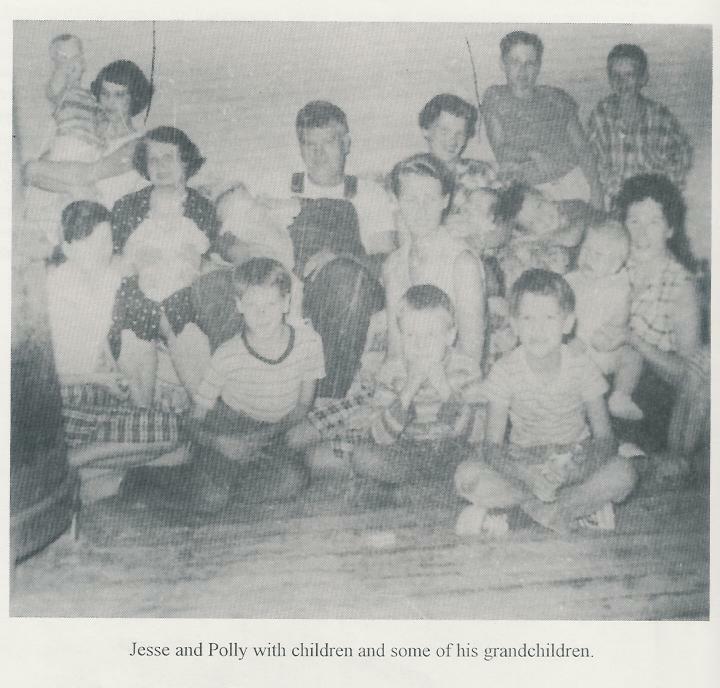 Sewell married Mary Ann "Polly" RIDDLE. Mary Ann "Polly" RIDDLE was born in 1838. She died on 8 Jun 1930. Mary married Sewell Archibald Albert MC MAHAN. M i Golden Washington MC MAHAN was born on 29 May 1875. He died on 21 Apr 1960. Isaac Matthew COGDILL "II" [Parents] was born in 1824 in Spring Creek, Madison, North Carolina. He died in 1893 in , , North Carolina. Isaac married Matilda Cardellia POTTER on 9 Jul 1871. Matilda Cardellia POTTER was born in 1848. She died on 26 Jul 1937. She was buried in Mount Pleasant, Ch. Cem, Madison, North C.. Matilda married Isaac Matthew COGDILL "II" on 9 Jul 1871. F i Idella Telitha Alice COGDILL was born on 2 Jul 1890. She died on 3 Jul 1967. George Milas TAYLOR [Parents] was born on 3 Jul 1930 in , Henderson, North Carolina. George married Noma Lee MC MINN on 24 Aug 1950 in Greenville, Greenville, South Carolina. Noma Lee MC MINN [Parents] was born on 20 Feb 1931 in Hendersonville, Henderson, North Carolina. Noma married George Milas TAYLOR on 24 Aug 1950 in Greenville, Greenville, South Carolina. Matthew COGDILL "I" was born in 1824. M i Isaac Matthew COGDILL "II" was born in 1824. He died in 1893. Tom PRESSLEY was born on 9 Nov 1902. He died in 1955. Tom married Matilda Cardellia POTTER. Matilda Cardellia POTTER was born in 1848. She died on 26 Jul 1937. She was buried in Mount Pleasant, Ch. Cem, Madison, North C.. Matilda married Tom PRESSLEY.